Since I’m busy enjoying cool weather and sunshine in Carmel, I’m going to keep it short and sweet in today’s EDIT – hope you enjoy my favorite finds this week! I mean, how insane is this Kelly Wearstler Tic Tac Toe set? A definite splurge, but the coolest thing I’ve seen in weeks. Also, I’m pretty sure I need this Mansur Gavriel backpack stat. I think it’s safe to say that we need those Loeffler Randall heels! They’re actually perfect! Hope you’re having a wonderful time in Carmel! I always love your edits! That bikini, that dress, those sandals…gorgeous!!! Love this neutral palette you have going on here! Hope you’re enjoying the sunshine! I have been eyeing that Nars polish for a while! Such a fun Spring color! Great picks! Eeekk those sandals and that skirt are divine! Love all your picks! Hope you’re having fun! love the thakoon white shirt dress– i’m on the hunt for a crisp white shirt dress for spring/summer this year and this serves as great inspo! Have so much fun in Carmel! I’m jealous! I love the glasses and the bathing suit, great picks! I have been eyeing those cups on net-a-porter! Great picks! Hope your having a blast on your trip! eek! NUMBER 1!!!!! LOVE! Annndd #13! 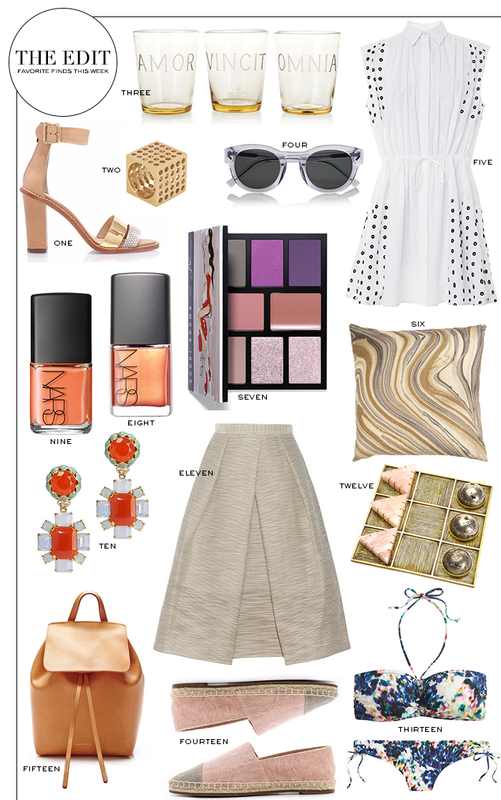 Great edit…and the Kelly Wearstler tic tac toe set is cool. I definitely need those Loeffler Randall sandals! Hope you are having fun in Carmel! I love it all! Those sandals are amazing, and I love the backpack! Love it all! That skirt is perfect!